Given the crucial need for power in a digitalized society — and the grid’s growing vulnerability — energy resiliency and reliability are organizational risk factors. How can risk officers within corporate organizations set these values? What is government’s role? Clean energy gained traction when the value of clean air and water was monetized by way of federal tax credits, renewable portfolio standards, long-term contracts and government and utility solicitations. Can these same mechanisms be used to create value streams for resilience? 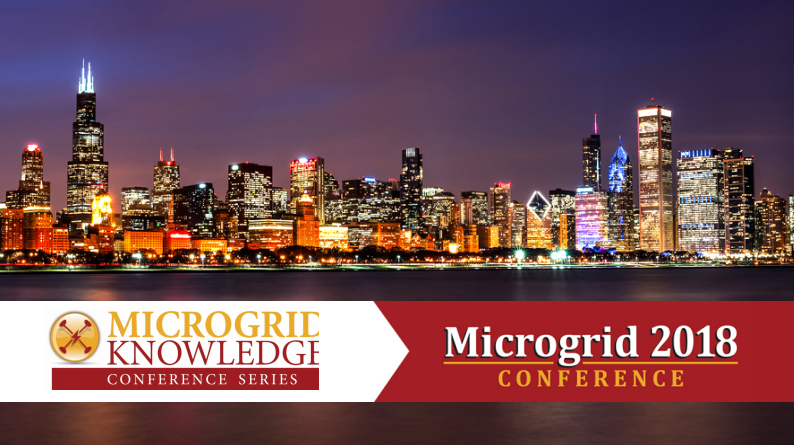 Experts from Schneider Electric, NEC Energy, Eaton and the Illinois Commerce Commission (ICC) gathered at Microgrid 2018 to discuss the value of microgrids and the energy resiliency they provide. During the presentation, Sadzi Martha Oliva, commissioner at the ICC, explained the state is planning and strategically integrating new technologies, and moving toward what Oliva called the "grid of the 21st century." Illinois is already the home to two utility-scale microgrids: the Ameren microgrid in Champaign, and the soon-to-be ComEd microgrid in Bronzeville. Illinois has become a leader in renewables and energy innovation due in part to recent policy decisions, including the Electric Infrastructure Modernization Act and the Future Energy Jobs Act. Next, the focus, will be on NextGrid Illinois, according to Oliva. Robert Kirslis, senior microgrid application engineer at Eaton, touched on the company's Power Xpert Energy Optimizer controller for microgrid and energy storage application, which increases energy resiliency and reduces down time by offering continuous operations of islanded power systems in case of a utility power failure. Next up, Philip Fischer, program director — distributed storage at NEC Energy, highlighted microgrid capabilities, including emergency support, support for integration of renewables, optimization and more. And the path to resilience is evolving, according to Mark Feasel, vice president of utility and smart grids at Schneider Electric. The historic approach has been focusing on redundancy, diversity and efficiency. Now, historically passive consumers are thinking about energy in a new way: cost, energy resiliency and sustainability. 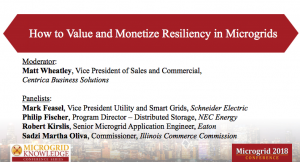 Download the full Microgrid 2018 presentation to learn more about how the market is valuing and monetizing resiliency in microgrids.